Dog River – 12 June 1810 – Plans are underway to construct a bridge over the Dog River. This new bridge will make a significant impact on the daily lives of the people in the community as they transport goods to sell at the Farmers Market. Winter has provided us with a shorter trip to Charlotte Town, but now we can enjoy a good route all year round. This new bridge is bound to decrease boat traffic on the Elliott River. There has been some resistance by local residents, but many say that it is hard to hold back time and the road to progress. 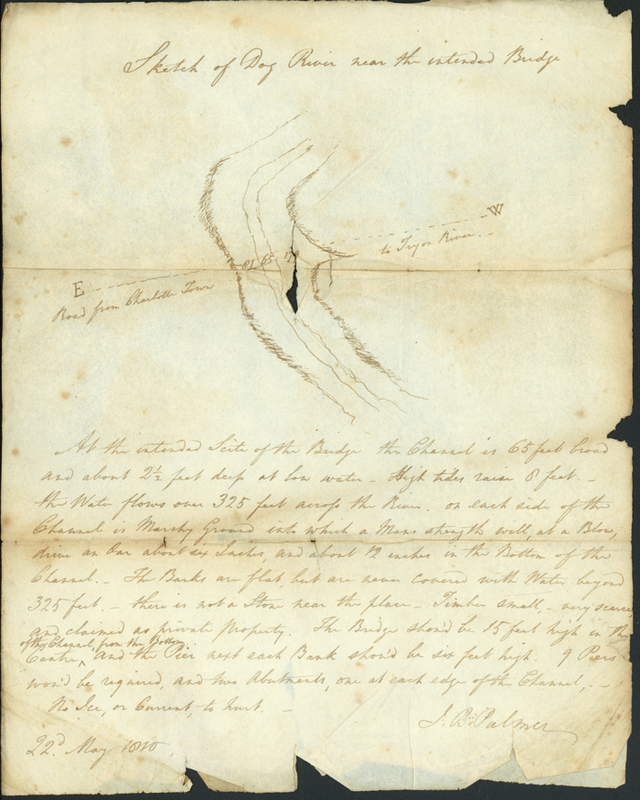 J.B. Palmer has provided us with a sketch and description of the intended bridge dated 22 May 1810. At the intended site of the bridge the channel is 65 feet broad and about 2 1/2 feet deep at low water. High tides raise 9 feet. The water flows over 325 feet across the river, on each side at the channel is marshy ground into which a man’s strength will, at a blow, drive an oar about six inches and about 12 inches in the bottom of the channel. The banks are flat, but are near covered with water beyond 325 feet. There is not a stone near the place. Timber small, very scarce, and claimed as private property. The bridge should be 15 feet high in the centre of the channel, from the bottom, and the pier next each bank should be six feet high. 9 piers would be required, and two abutments, one at each edge of the channel. No ice, or current, to hurt. Special thanks to Doreen Pound for finding this historical treasure. Wow – that is cool! Imagine 200 years ago, surveying for a new bridge. So many interesting things in that article, from the “Dog River” to the way of measuring depth of sediment (“man’s strength will, at a blow, drive an oar…in the bottom of the channel”), to the details about tides and depths to the hand-drawn sketch. Quite a bit different from building bridges today. It would be interesting to repeat his surveys today with the new bridge and all the various changes to the river thanks to the causeway, etc..